Dumalneg is one of the hintertowns of Ilocos Norte province and was named after the early leader Dumalneg who got his name from a famous river. This is a small and peacefull town located in the north of the province. It is inhabited by indigenous people such as the Yapayaos who are peace-loving people. In the old days, not much known to many that tribal fights and rivalries existed among these tribes. 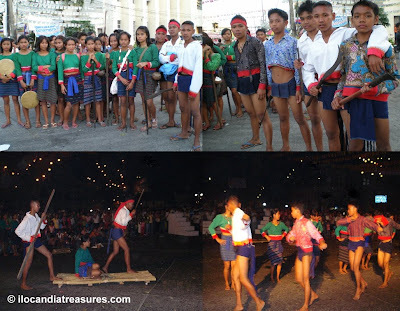 In this case, Yapayaos of Dumalneg had conflict with the inhabitants of Kalanasan and Apayao. Their bloody encounters rooted from a blossoming romance between Agudang and Edan. Agudang was an Iyapayao or Idaya lad while Edan was an esquisite Immalaud lass. The assertiveness and prudence of Agudang caused by his faithful love to Edan, relatives of Edan regarded it as form of arrogance and insolence and that they could not accept that someone from another tribe was much more superior to them. As a result of their hatred to Agudang, they killed him and triggered a tribal war. However in 1908, with the desire to end the hostilities among them, they burry their hatchets and a peace pact called Lannak was made between them. A depiction of this peace pact was staged by young Yapayao lads and lasses of Dumalneg during the celebration of Ragrag-o Festival of the province.